When deciding on paving a driveway, there are several materials to choose from. Each option comes with its own unique characteristics and offerings. In this article, we will discuss the pros and cons of paving concrete versus asphalt driveways in Ontario. Concrete driveways are known for its durability, longevity and versatility. If installed properly and to code, this material requires minimal maintenance while keeping weed growth at bay, making it looking its best for years to come. Concrete can also withstand more environmental elements of the freeze and thaw cycle, a definite benefit for Ontario homeowners. In addition, with concrete’s vast color, pattern and texture choices, it allows for unique driveway design and style. This in turn adds to the curb appeal and increases the value of a home. 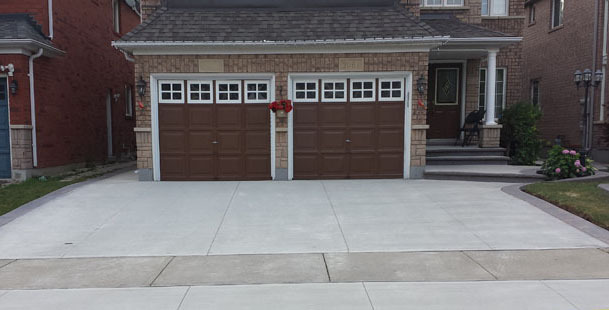 Click here for a full list of concrete driveway pros & cons. Although concrete driveways may cost more to install than asphalt driveways, its long shelf life – lasting upward of 25 years – will make the initial investment well worth the price. When compared to concrete, asphalt driveway installation is more economical. However, asphalt driveway has a life expectancy of approximately 8 years – which is much shorter than concrete. In addition, its limited color pallet, with only black as the option, makes it limiting on design and curb appeal. Ontario’s temperature fluctuates between 30 degrees Celsius to -20 degrees Celsius in any given year. With this extreme temperature change, asphalt may crack easily after a couple of winters. And during the heat wave days of summer, the black asphalt absorbs the heat, making the surface extremely hot. This high temperature may cause the asphalt to become pliable and soft which makes it easy to scratch, scruff or chip away. In addition, children are advised not to play sidewalk chalk or toys on the driveway to avoid their skin coming in contact with the hot surface which may cause burns. No matter what material you choose, driveway installations should be done by reputable and experienced landscapers. If you are unsure of what material to use for your driveway or want additional information on this topic, feel free to contact us at Markstone Landscaping. Markstone Landscaping specializes in concrete landscaping for both commercial and residential properties. Our service offering includes poured, stamped, coloured & textured concrete paving. With over 10 years of experience in installing driveways, front entrances and backyards, we are confident that we can help you with your landscaping needs.